Styles of Fine Art Painters in Ireland During the Twentieth Century. At the end of the 1930s, art in Ireland was dominated by a group of painters and sculptors who descended from an earlier Irish tradition which combined Slade School and Impressionist continental art. Their mentors were William Orpen (1878-1931) and John Lavery (1856-1941). They included Sean Keating (1889-1977), Leo Whelan (1892-1956), James Sleator (1889-1950), Diarmuid O'Brien (1865-1945), Maurice MacGonigal (1900-1979) and Sean O'Sullivan (1906-1964). They were other distinctively Irish artists; namely, Paul Henry (1876-1958), Charles Lamb (1893-1964), James Humbert Craig (1878-1944), William Conor (18811968). And less distinctively Irish artists such as Mary Swanzy (1882-1978), W J Leech (1881-1968), Harry Kernoff (1900-1974), Muriel Brandt (1901-81), and George MacD Kane (1889-1954). Towering above them all, belonging to no particular tradition, yet more Irish in sentiment and sensitivity was Jack B Yeats (1871-1957). and early Cubist, Mary Swanzy. 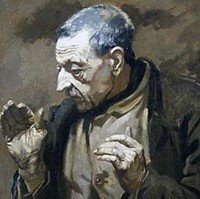 The traditionalists in Irish painting were not ignorant of European developments in art - such as Fauvism, Cubism, Dadaism, and Surrealism - but they did not like what they saw, hoping it would go away and that art would return to the representational tradition of Renaissance painting and sculpture. At best they regarded so-called modern art as experimental. The Dublin Municipal Gallery of Modern Art (founded after Sir Hugh Lane) would hardly ever admit any work which was painted more recently than the time of Corot - a Rouault was rejected as blasphemous and a Henry Moore was rejected as obscene. [See also Modern Art]. The attribute of those who were distinctively Irish was a fondness for romantic Irish Landscape, romantic Irish peasants and fishermen, and a romantic presentation of Irish history. [Here, 'romantic' means poetic or lyrical.] Paul Henry (1876-1958) is the prime example in painting, being one of the foremost Irish landscape artists. His Connemara landscapes with the dominance of cloud, mountain and lake, had by this time become cliched but he could still produce a good picture. Sean Keating, a more forceful painter, was passed his prime but his romantised pictures of peasants and heroes of the war of independence still had much vigor. And Leo Whelan could still turn out an impressive portrait. The same can be said of those who did not pursue Irishness as such in any form. Kernoff, Brandt, Leech and Swanzy were established in their ways by the 1940s yet were still producing works of a high quality. The overarching genius of this time was Jack B Yeats. In 1943 he was already 73 years old and lived to be 86, yet he was still turning out work which was the equal of anything he had done in the previous 30 years. As with all great artists he could leave whole areas of his canvases blank while filling the rest with masterful brushstrokes. The period 1944-1956 is strewn with evocative masterpieces - The Little Sisters of the Gang (1944), Above the Fair (1946), The Sea and the Lighthouse, Freedom (1947), Through the Silent Lands (1951), Glory (1952) The Plank Road and The Top of the Tide (1955-6). Yeats' originality of mind and of technique placed him among the most daring of the moderns whom he did not resemble in other ways. He thus acted as a bridge to the younger generation of painters who did not want so much to break with the tradition as to reach beyond it. In 1943, the most important event in the calendar of the visual arts in Ireland was the Royal Hibernian Academy's annual exhibition. The year before, the selection committee had rejected 'The Spanish Shawl' by Louis le Brocquy. This prompted a number of artists to come together and organize the Irish Exhibition of Living Art (IELA); chief among them were Mainie Jellett (1897-1944), Evie Hone (18941955), Fr Jack Hanlon (1913-1968), Norah McGuinness (1901-1980), Louis le Brocquy (b. 1916), and Margaret Clarke (1888-1961). The Exhibitions of the IELA injected some visual excitement into the drabness of wartime Dublin and offered a welcome alternative to professional but dull RHA exhibitions. Immediately after the war, artists from abroad - Pablo Picasso, Henri Matisse, Georges Braque, etc - were invited to exhibit at the annual IELA shows. Also, it should be noted, that many Irish artists exhibited in both. Nevertheless, they represented different points of view in art. The RHA maintained what it believed to be 'the tradition' while the IELA was open to every new development in the arts, including Irish sculpture. 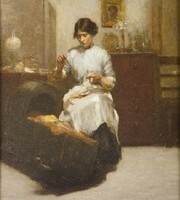 Many of the twentieth century Irish artists who exhibited at those first exhibitions had worked abroad. In 1920, Evie Hone went to Paris to study under the Cubist Andre Lhote (1885-1962). The following year she was joined by Mainie Jellett and, in 1929, by Norah McGuinness. In 1922, Hone and Jellett persuaded Albert Gleizes (1881-1953), author of the first book of Cubism (Du Cubisme, 1912) to accept them into his studio. Gleizes' analytical method suited Jellett well. When she returned to Ireland she preached in print and on the wireless the virtues of abstract art. She could be said to be the only persistent Irish Cubist. While Evie Hone's work was initially almost indistinguishable from Mainie Jellett's it was not long before Hone abandoned the severities of Analytical Cubism for the softer and more luxuriant colours and forms of medieval stained glass and sculpture. Irish artists generally borrowed from the developments on the continent and absorbed them. In the 1940s and 50s there were few Irish artists who could be identified with any continental or cross channel movement. What the continental movements in particular did, was to liberate Irish art from the thraldom of exact representation. Not many Irish artists of this period wanted to go abstract but many of them felt that with this new found freedom of artistic expression they could capture the colour, charm, oddity, atmosphere, earthiness, romance, and spiritual qualities of Irish life landscape and beliefs. Norah McGuinness made her own the peculiar qualities of Dublin Bay and the Liffey estuary, with its sandbanks at low tide and the ubiquitous gulls depicted in fluent swirls of paint. Nano Reid (19051981), more abstract and informal, put together images of her domestic surroundings - a cat, a chair, a view from a window. Patrick Collins (1910-1994) captured the essence of a landscape - an island, a piece of bogland - in chalky, semi-abstract colours. 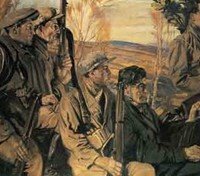 The Northern Painters, Gerard Dillon (1916-1971), Colin Middleton (1910-1983), George Campbell (1917-1979), Dan O'Neill (1920-1974), TP Flanagan (b.1929), Arthur Armstrong (1924-1996) and William Scott (1913-1989) did likewise. Scott's compositions of leeks, lemons, eggs, pots and pans, elegantly summarized Irish peasant kitchens and, though they became progressively more abstract, they never completely parted company with their origins. Dillon, Middleton and O'Neill used the new found freedom of composition to express the odder aspects of Irish life. Of these, Dillon in his way, though by no means an abstract artist was as formal in some of his compositions as William Scott. TP Flanagan and Armstrong held closer to the traditional type of composition, though semi-abstract in point of vagueness. Two other artists of this period stand out from the rest. They are Patrick Swift (1927-83) and Patrick Hennessy (1915-1980). Today they might be called photorealists. Even if they are, it still remains that in their own way they made composition of line and colour in which the subject matter had minimal significance so they too can be regarded as abstract painters. One notable artist of this period who heralded the way into the next period of recent Irish art - the generation born in the 1920s and which came into its own in the 1950s - is Patrick Scott (b.1921). He started in the 1940s as a more or less straightforward painter of landscapes and other subjects, and gradually became more abstract, until 1959, when he started his "bog" series by using paint on unprimed canvas, in which he conveys the sensation of intense sunlight over a vast stretch of bogland covered with a thin vapor. From this, he progressed into completely abstract gold paintings, which still had a suggestion of gold Celtic ornament, and hence of Irishness. But he also did designs and some paintings which were entirely abstract. Finally there is an artist of the period who did not go all the way along the road towards abstraction and yet became increasingly more abstract and esoteric. That is Louis le Brocquy (b. 1916). By the late 1940s le Brocquy had acquired an international reputation with his series of semi-abstract family pictures. By the late 1950s, his figures had been reduced to a bare white impasto and were called 'presences'. These were followed by a series of ethereal heads, sometimes the heads of literary figures (eg. WB Yeats, James Joyce, Samuel Beckett), sometimes heads with bloodstained hands which were seen as through a frosted glass screen of formal opaque concentric squares. Le Brocquy had achieved a kind of clinical purity perfectly in keeping with the feeling of some contemporary international paintings and related to Irish sentiment only by their particular brand of mystery and horror. In this respect, le Brocquy resembles another famous painter of Irish origin, Francis Bacon. It is hardly too far fetched to see an analogy between Francis Bacon's presentation of human beings, from popes and personal friends to anonymous shapes in extreme situations and enclosed spaces and, say, some of the creatures in Becketts novels and plays. For Le Brocquy's position among Ireland's most famous and successful painters, see the Most Expensive Irish Paintings. With the next generation of Irish artists, we find the process of absorption of continental influence carried a stage further. Camille Souter (b.1929), for instance, is quite a lot more abstract than say Patrick Collins, and yet she conveys the essence of Calary Bog of a canal or a fish. Anne Madden (b.1932) who is even more abstract, conveys the essence of an Irish landscape or the feeling of mystery and monumentality and yet ethereal quality. Barrie Cooke (b.1931), Basil Blackshaw (b.1932) and Patrick Hickey (1927-1998), each in his different way, gives a feeling for a particular Irish landscape - Divis Mountain, The Nore Valley or County Wicklow - in almost entirely abstract terms. Even portrait painters such as Neil Shawcross (b.1940) and Blackshaw were informal in their technique in the manner of semi-abstract painters. One of this group went over to totally abstract painting by abstracting from landscape (if the Dublin docks can be called landscape) and the tensions of circus acrobatics. This was a latecomer to painting, Cecil King (1921-1986). But by this time - late 1950s and 1960s - many of the painters previously mentioned, for example TP Flanagan and more especially Patrick Scott, were moving further in the direction of abstraction. It was the time when the impact of post-war formal and informal abstract art from the continents of Europe and America were beginning to be felt in Ireland. There were, however, a few artists of this generation who do not quite fit into the general pattern. These were most notably, Patrick Pye and Edward Maguire. Patrick Pye is a figurative painter of religious pictures and it is not at all surprising that he should also work in stained-glass. Maguire by contrast paints portraits and pictures of birds with meticulous detail in a manner not unlike that of earlier work by Patrick Swift and Lucien Freud. Yet, though he not infrequently captures a good likeness of his sitter, his pictures are not portraits in the conventional sense but rather formalized compositions in colour relationships. The same is true in a more obvious way of the pictures by Charles Brady, where the subject is little more than a pretext for the composition. Thus by the mid-1960s, though Irish artists (and this included academicians such as the President of the RHA, Maurice MacGonigal) were alive to developments outside Ireland, they absorbed them into the Irish mould. Of the established artists, Patrick Scott and Cecil King were rather exceptional in their geometrical abstraction and Anne Madden in her informal abstraction; yet even they, as has been said, were not far from two of the sources of inspiration in Irish art; landscape and popular entertainment. This may be due to the isolation of Ireland during the war, but it may also be due to conservatism on the part of Irish artists. Nevertheless, the next generation, which came into its own in the mid-1960s was more susceptible to what was coming out of New York, Los Angeles, Zurich, London, Dusseldorf and to a lesser extent, Paris. By now, An Chomhairle Ealaion, established in 1951, was buying works of Irish artists and distributing bursaries; the generous Carroll's Prizes for works at the IELA Exhibitions, the Haverty Trust, the Oireachas Douglas Hyde Gold Medals, and the Belfast Open Competitions were stimulating artists with rewards; there were exhibitions at the Tate and Whitechapel Galleries in London and, from 1967, the Rosc exhibitions at the Royal Dublin Society Grounds in Ballsbridge, and other international exhibitions in Trinity College; the Municipal Gallery (which at last was becoming a gallery of Modern Art), the National Gallery, the Ulster Museum, as well as some adventurous Irish art galleries such as the Dawson and David Hendricks Gallery, were introducing artists to international works; and Irish Artists were being represented at biennales in Venice, Paris - and winning prizes. Under these circumstances it is not surprising that some younger Irish Artists should look rather more international than their predecessors. This is particularly true of Micheal Farrell (1940-2000) and Roy Johnstone, and artists such as David Crone and Brian Ferran who did painterly collage type paintings. But these artists had Irish elements in their work, even if these did not belong to the tradition. Farrell for example used Celtic motifs. Another trend in international art, Pop Art, is represented in the work of Robert Ballagh (b.1943), with his pastiches of old masters, his licquorice all-sorts and the like. But Ballagh's work is no slavish imitation of international pop. He introduces a vein of wit and irony which is part of the Irish literary tradition, if not of the tradition in art. The one artist from this group who might be said to continue the tradition and stand somewhat aloof from the international scene is Brian Bourke (b.1936). His dour pictures of his fellow humans and his landscapes have little in common with any contemporary movement yet they powerfully convey a darker side of Irish life which fascinated Patrick Kavanagh. However, events were soon to overtake this generation which forced it into a different kind of Irishness from its predecessors, namely, the "troubles" in Northern Ireland. Artists reacted to this in various ways, usually in an oblique manner which showed artistic perception and sensitivity. Some artists made political gestures. For example Farrell refused a prize and Brian O'Doherty ceremonially changed his name to Patrick Ireland, and both refused to exhibit in Britain until the Northern issue was resolved. Farrell, however, after a series of fairly violent pictures including collage-like reproductions of press headlines and photographs of violent incidents, settled down to a more gentle satire with his Miss O'Murphy Series. Thus, on the whole, the more effective comment was the oblique - Ballagh's photo-realistic picture of the Miami Showband with the glass shattered as by a bullet, or barbed wire implanted in plexi-glass by Deborah Brown. A living art is by definition exploring new possibilities. At the beginning of the 20th century, it was said that a picture or statue should have a recognizable subject matter, that this subject matter should be presented in such a way as not to distort reality (idealization and fantasy, if clearly indicated, excepted) and that beauty should be the aim. The Fauves, Cubists, Surrealists and, above all, the Abstract Artists defied these assumptions. Irish Artists who accepted this revolution in the conception of art, had a struggle to win acceptance even though there may be some people who still find the work of Mainie Jellett, Patrick Scott, Cecil King, Nano Reid or Anne Madden hard to appreciate. Nevertheless, by the beginning of the 1970s, their battle had been so thoroughly won that they and the other artists so far mentioned had become accepted and established as part of, if not "the" tradition, at least "a" tradition in Irish Art. By the early 1970s the pioneers of the Living Art Movement may have looked a little like the traditional painters in the early 1940s. Since then there had come, not only Pop Art and Op Art (optical), but environmental and performance art, ephemeral and conceptual art, each challenging the traditional conceptions of art, particularly the notion of the art object and the permanent preservable work. But even within the traditional forms of painting and sculpture there were changes; art had become less "aesthetic" less romantic more didactic and more satirical. For this reason and to adhere to its original intentions, the committee of the IELA decided to hand over to an entirely new committee of younger artists. In 1973 the new committee held it's first exhibition in the Project Gallery. The Irish Exhibition of Living Arts activity continues to the present day, led in the 1960s and 1970s by such artists as Brian King, Robert Ballagh, Michael OSullivan, Tim Goulding, Micheal Farrell, Martin Gale, and by European artists making their home in Ireland like Erik Adriaan van der Grijn, Alexandra Wejchert and Adrian Hall. During the 1980s, Living Art expanded its purview to include video and performance art, as well as sculpture and painting, exhibiting the works of Cecily Brennan, Eilis OConnell, Helen Comerford, Aileen MacKeogh, Nigel Rolfe, Joe Butler, and many other emerging artists. A new expressionist trend has appeared within the Independent Artists group, as exemplified by artists such as Patrick Graham, Eithne Jordan, Michael Kane, Patrick Hall, Brian Maguire, Michael Mulcahy and Michael Cullen. Among the exciting new sculptors are Conor Fallon, Rowan Gillespie, Michael Bulfin, John Behan, Edward Delaney, and John Burke. How the history of Irish art will develop in the 21st century remains to be seen.  For more information about painting and sculpture in Ireland, see: Homepage.